The Best Western Plus Belize Biltmore Plaza in Belize City is the perfect starting point for exciting day trips to any of Belize's great natural attractions. With well-appointed rooms and suites that include free Wi-Fi, and a restaurant that serves fresh traditional cuisine, you'll enjoy a host of welcoming amenities to ensure a comfortable stay. Start off your day by breaking a sweat in the fitness center and a dip in the pool, and end it with a relaxing massage or facial in the spa. 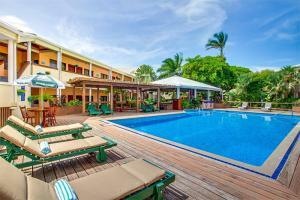 Conveniently located 10 minutes from both the International Airport and the local Belize City Municipal Airport.